Thinking of renovating the bathroom? 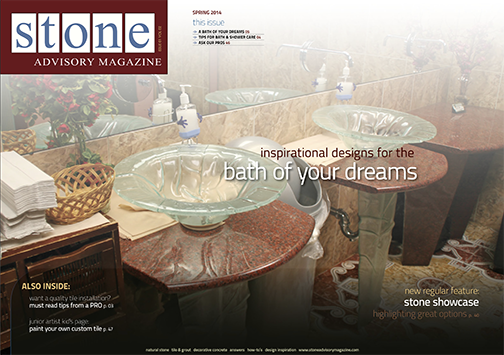 This Designing With It features inspirational designs for the bath of your dreams. You’ll also find important tips for bath and shower care, as well as a quality tile installation. 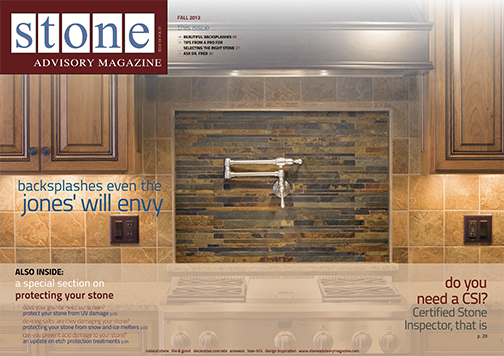 We’re proud to announce Stone Showcase, a regular segment going forward which will highlight different stones. 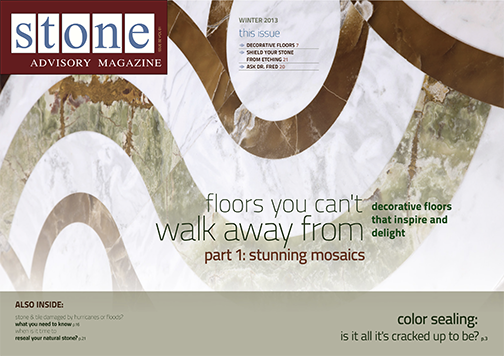 This issue: Soapstone. Bet you never thought of a backsplash as jewelry before! Once you take a look at this issue’s Designing With It feature, though, you’ll know exactly what we mean (and you’ll probably start looking for excuses to renovate the kitchen.) We’ll also tell you how to pick and protect your stone, and when it’s time to call a stone inspector. If the word “concrete” conjures only a boring grey slab, have we got a surprise for you! 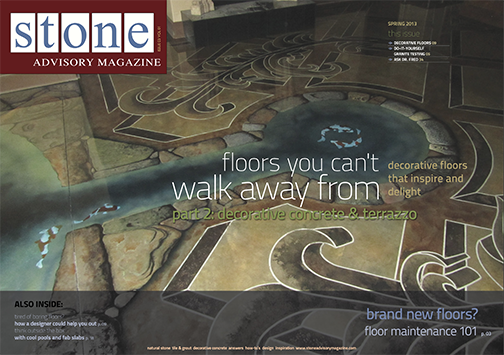 Designing With It: Floors You Can’t Walk Away From will have you longing for a nice concrete floor to transform into a masterpiece in no time. And don’t forget about terrazzo. This popular 50s and 60s floor covering is still as relevant and beautiful as ever. We often think of mosaics as an art form of the past, but nothing could be farther from the truth! Our Designing With It feature highlights some awe-inspiring, contemporary applications. You can also learn about water damage to stone and tile, etch protection, when to reseal your stone, and the process of color sealing your grout. 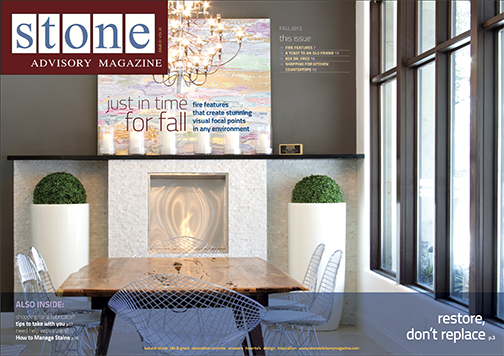 Ever wish you could add a fire place or other fire feature to your home without having to do a major renovation? Our Designing With It segment shows you how. And that’s not all! From tips on shopping for countertops and fabricators, to managing stains, to celebrating the 60th anniversary of an industry icon, you won’t want to miss a page!